Following an incredible tour of Wales and the USA in 2018, including performances in New York and Washington DC, the Torch Theatre Company is delighted to once again bring the story of ‘Grav’ to the stage for 2019. Whether you are a Rugby fan or not, only the hardest of hearts would fail to enjoy this production.. The Greatest Rock & Roll Band In The World is a bold statement but Showaddywaddy has lived up to that title for the last 4 decades! So come and join the ‘Dancin’ Party’… You’ve Got What It Takes! Artistic Licence Theatre Company is back at the Torch with a divine musical version of the film made famous by Whoopi Goldberg. Dancing nuns, singing gangsters and a visit from the Pope - just a few of the many reasons NOT to miss 'Sister Act - The Musical'. Mick Evans has a problem. His childhood imaginary friend has become his tormentor. The system doesn’t suit people who don’t conform, people like Mick, people like his pupil, Stewart Skinner. Cracked is a moving, thought-provoking play about vulnerability and the universal need for love. 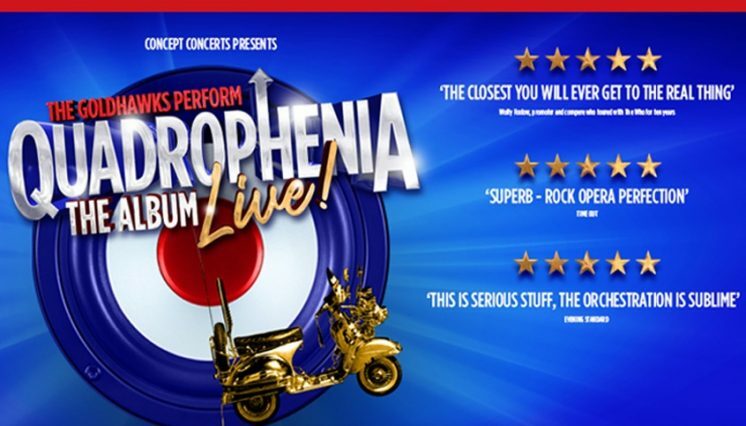 This production, acclaimed by the Sunday Times as “Mighty, moving and unstoppable,” sees this dynamic 8-piece band deliver a stunning live performance of The Who’s smash hit concept album, Quadrophenia. From the very first show it has received standing ovations. Backed with exciting, and sometimes heart-wrenching, large-screen projection of archival footage, the emotions, tension and raw power that the music demands is delivered masterfully, with an amazing replication of The Who’s sound. Music fans are invited to the biggest party of the year as the unstoppable Magic of Motown show steams into town! Seen by over a million people, it's no surprise that the show is one of the biggest success stories in British theatre history, even performing as special guests at the 2016 Royal Variety Performance after-show party.